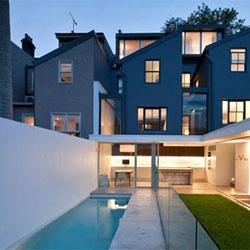 MCK Architects' Paddington x2 Residence. 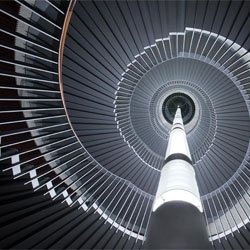 Usher Hall, Edinburgh by Spiers + Major. 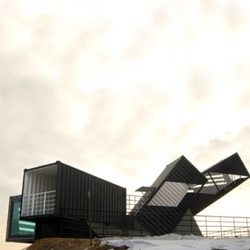 OceanScope is a public observation deck made out of old shipping containers, designed by AnLstudio. FEATUREDNaef Tectus, a beautiful wooden desk toy in black and white created solely by applying the golden ratio. Full unboxing and up close look! 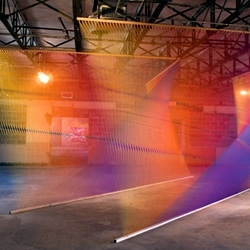 Gabriel Dawe's colorful 'Plexus' installations using Gütermann thread, wood and nails. 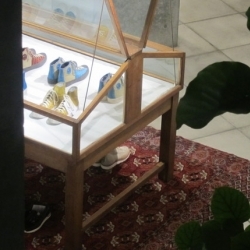 A quick look at visvim's underground, poured concrete, glass and steel Free International Laboratory shop in Tokyo. 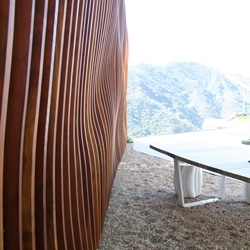 Ilan Dei Studio has recently completed a 45′ sculptural wall for a private residence in Los Angeles. The wall is inspired by the topography of the canyon that the property sits on and the corresponding view of the Pacific Ocean. How does an international architecture firm design its flagship workspace? We found out when we took a walk through KPF’s sleek Midtown offices. 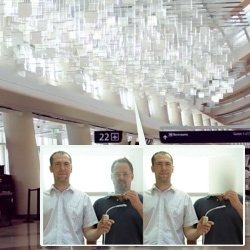 VIDEOVideo of the 'eCLOUD' dynamic sculpture made of polycarbonate tiles that fade between transparent and opaque states reacting to real time weather data from around the world. charming pre-fab that uses the integration of a loft with space saving layout, still cozy while maximizing the view. 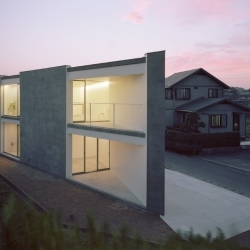 Located in Yamanashi, by architect Toyo Ito of Blue Ant Studio. New Hermès store, Rive gauche, Paris. Opening in a 1935 old swimming pool, decorated by Denis Montel out of amazing disposable wood structures. 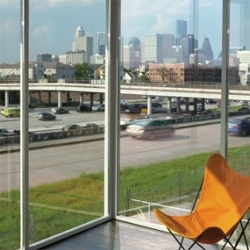 Architect Ronnie Self's home is situated overlooking a busy Houston freeway. T-house in Kyoto by Atelier Boronski. Merrill Wright's home on the San Juan Islands off Washington state. 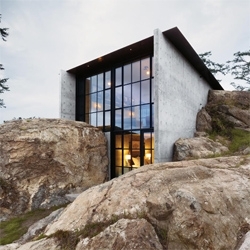 Designed by Tom Kundig. 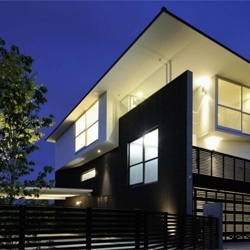 This FARM project in Singapore is part of our COLOR/COLOUR EVERYWHERE top ten - color in architecture! 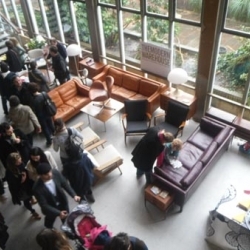 Mid.Century Modern show at Dulwich College was chock full of visitors as well as beautiful vintage pieces, great for clients who are hoping for a scheme that incorporates furniture or decorative pieces from the 40s through to the 70s. 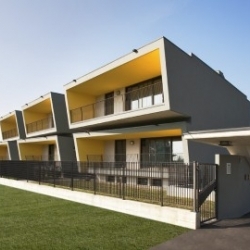 'Shift Housing' in Cremona, Italy is a new project recently completed by Milanese architecture firm AquiliAlberg. 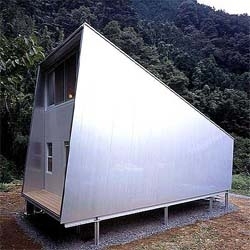 The Kawabe No Sumika (Riverbank House) comes from Mayumi Kawamoto and Atushi of mA-style. 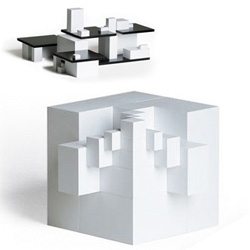 It has a very distinctive geometrical shape, using very clean straight lines and sharp edges. 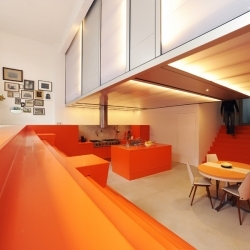 A former ambulance garage is rebuilt to be a very delightful new home in Rotterdam. 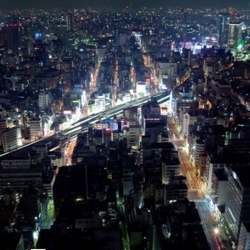 situated on a park it's view is fantastic. 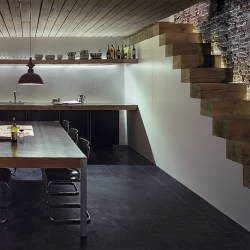 By Doepel Strijkers Architects. 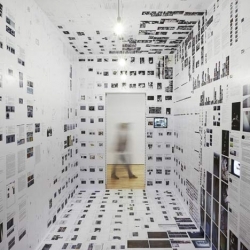 The installation "The Weak Metropolis: for a “New Charter of Athens” by Andrea Branzi at the Mak of Wien. 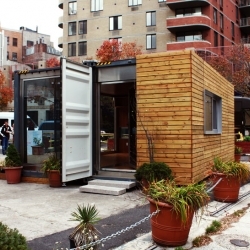 A prefab shipping container home called MEKA has popped up at the corner of Washington and Charles Street in NYC's West Village. Designed by Michael de Jong. 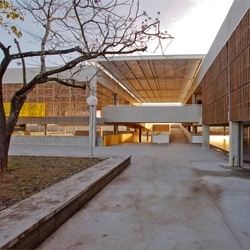 Stunning public school in Votorantim, Sao Paolo designed by Alvaro Puntoni. 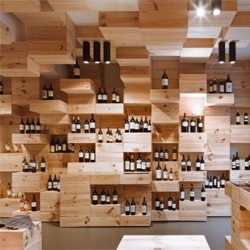 Swiss design firm OOS designed this gorgeous interior in the Albert Reichmuth wine store, Zurich. 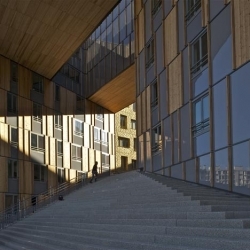 Erick van Egeraat, Combarel-Marrec, Manuelle Gautrand, Pierre Gautier and Winy Maas designed this stunning building in Lyon. 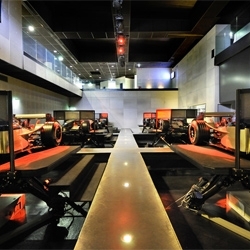 i-way, an an unusual venue in Lyon dedicated to high end car simulators. It houses18 different vehicles that can be driven using six degrees of movement. Designed by Cyrille Druart. 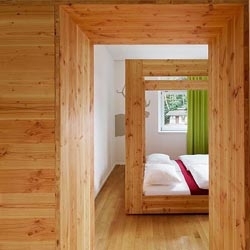 The Forsthaus Hotel, in Ramsen, Germany, is a converted old forester house designed by Naumann Architektur. 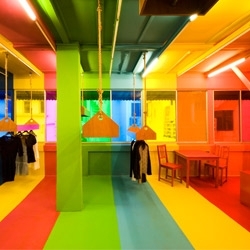 The project modernized the old structure through the use of pop colors, clean lines and unexpected details. In the age of the megaproject, time-lapse photography allows us to conceive of the process of building at a scale that we would never be able to imagine otherwise - see our 10 favorites. 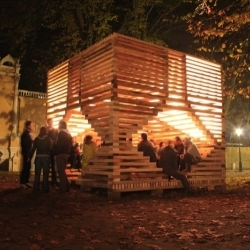 Barkitecture 2010. 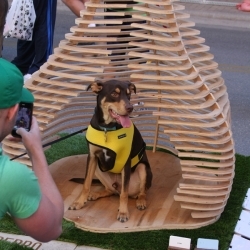 Austin's best architects and designers put their skills to creating dog houses. This is Studio Autoforma's entry which won "Most Unusual". 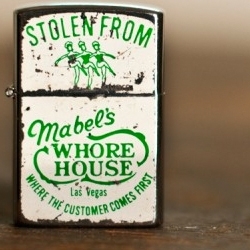 ApothecaryZero - Great selection of vintage & primitive pieces from all over the USA. 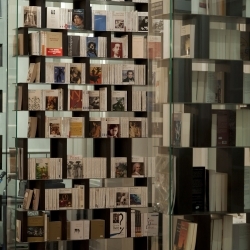 'Elle' system by Italian firm Rapsel. 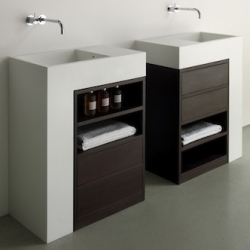 A bathroom cabinet that incorporates a sink and storage in a single Corian and wood module. Compact and contemporary. ‘Watering Holes’ fountain by Robin Monotti Graziadei. Winner of the Tiffany Across the Water & Royal Parks Foundation International Competition. 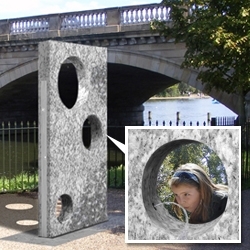 Features circular holes for adult, children/wheelchair and pets' drinking heights. THE MISPLOTS: homes produced from mistakes during the computerized fabrication process. 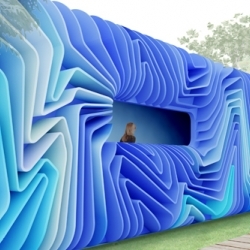 Design for a transportable storage shed / lounge / boutique. Miilu, an installation by Sami Rintala. 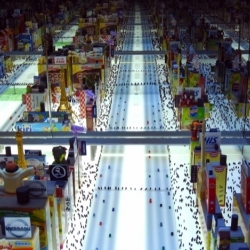 Part of XII Biennale di Venezia. 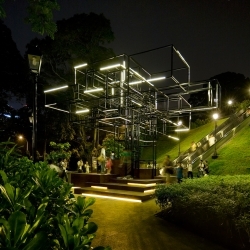 FARM Singapore created a sculptural light installation called The Tree at the National Museum of Singapore! An award-winning time capsule Mid Century Modern home survived basically untouched for over 50 years in small town Ontario! 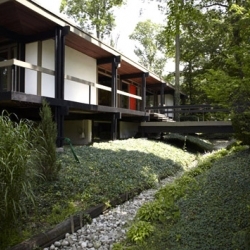 Completed in 1960, drafted by Saul Herzog with James Secord as architect. "Laboratory of living" in Utrecht by Studio Rolf & Zecc Architecten. Architects Joris De Schepper and Thomas De Ridder at S.M.A.K – Museum of Modern Art in Ghent offer visitors a glimpse at the museum behind the scenes. 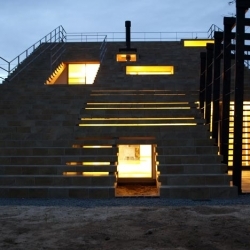 Stairs house by y+M Design Office in Oda-City, Shimane-Pref, Japan. 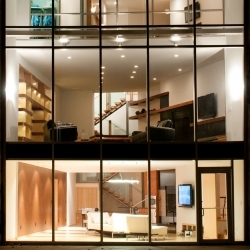 The Enclave is an interior design project by Jamie Herzlinger. This contemporary project was done for a world traveler client, living in Milan. Amazing transformation from 'before' photos. 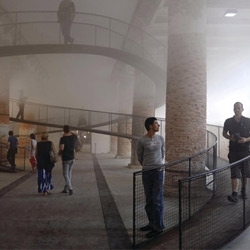 Transsolar & Tetsuo Kondo Architects’ "Cloudscape," at the Venice Biennale Architecture Exhibition - directed by Kazuyo Sejima. 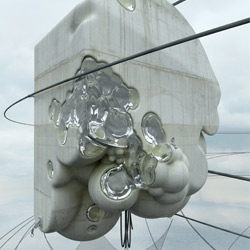 Part of Architect Magazine's Venice Beinnale review. 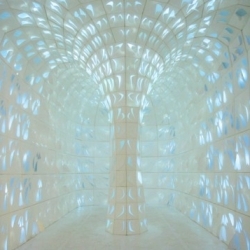 Hope Tree is a mesmerizing installation seen at this year's Tokyo Designers Week 2010 that combines paper and light within a 20 foot shipping container. By 24d-studio. At first glance, it might seem difficult to reconcile modernist architecture, with a rural, forested site in the midst of Ohio. 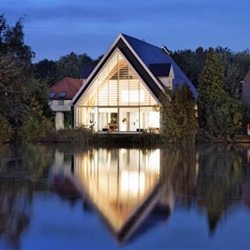 However, architect Jim Dorenbusch found his inspiration in the work of Alvar Aalto and other Scandinavian modernists. 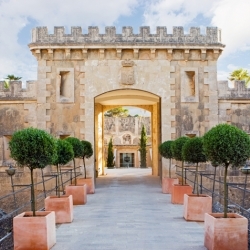 Cap Rocat is a retired military base in Spain, totally transformed into a private boutique hotel! The adult-only resort overlooks Mallorca’s Bay of Palma and was restored by Antonio Obrador. 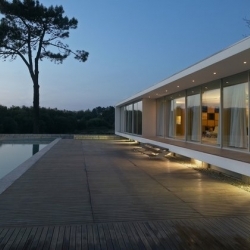 Vila Nova de Cerveira House in northwest Portugal was designed by deMM Arquitectura, promoting the relationship between interior and exterior, integrating the astonishing surroundings on a glass interior. 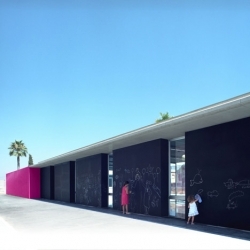 I love the blackboard walls at this school extension in Torrevieja, Spain by Dooa Arquitecturas. Incredible photos of a church conversion in Rotterdam by Ruud Visser Architects in collaboration with Peter Boer.